According to several sources, Rajon Rondo will not play in Game Five of the Boston Celtics-Chicago Bulls series in Boston tonight. Rondo says he will not play tonight. Evidently, not even Rajon's stoic determination to shine on the national stage is enough to get him on the hardwood tonight, with the bone evidently still yet to heal in the incredibly long (to Rondo) week he's given it to set. Of course, this was likely the case, and any appearance by Rondo will likely entail a lot of pain and very little actual ball-handling and shooting. Still, as Mark Allison and I discussed on the most recent CelticsLife Pod, his awareness of Celtics offense and ability on defense could conceivably provide a minor boost to the Bulls should he be willing to whack a fractured digit for the greater (Chicago and arguably Celtic) good. Rondo said he can't do much with the thumb still. "It's still broke." 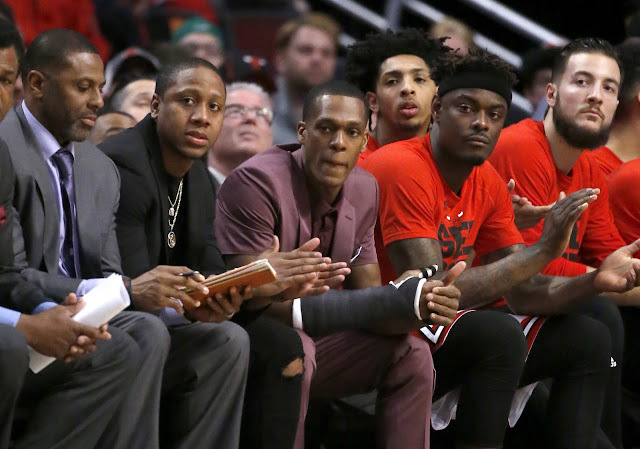 Of course, a "wheelchair game"-style dramatic entrance is not out of the question until the Bulls need to provide a game roster tonight, and I would not at all be surprised if he gave it a go if the Bulls are staring down elimination, so even with this news, don't be surprised if we see more of Rondo this season. Rondo: "I think I'm Wolverine but it hasn't actually healed."